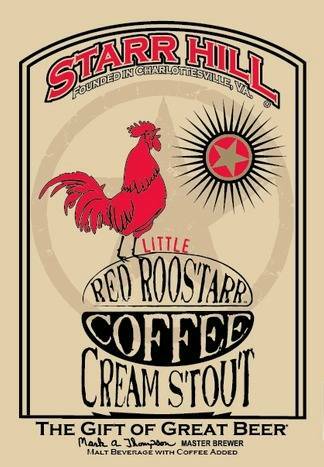 Two tradition rich, hands on crafts – brewing beer and roasting coffee – combine in Starr Hill’s new Little Red Roostarr Coffee Cream Stout, being featured at two Roanoke release events this Wednesday night. While the beer should be delicious, what is certain is that it will have plenty of local flavor. 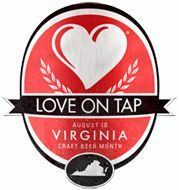 The Crozet based brewery is using coffee roasted by one of Virginia’s premier coffee roasters, Red Rooster in Floyd, Virginia. Tinnell’s Finer Foods on Crystal Spring Avenue and The Wasena City Tap Room are the locations for the events, with a bottle tasting at the former and the beer likely to be on tap at the latter. Also, according to tweets last week from their distributor, Starr Hill Founder and Master Brewer Mark Thompson, as well as Red Rooster Co-Owner Haden Polseno-Hensley, will be on hand at the Wasena City Tap Room event. Tinnell’s regularly sells Red Rooster Coffee on their shelves, which makes for a great tie-in there. There will also be release events the following evening in Floyd at Oddfella’s Cantina and at Dogtown Pizza. Cream Stouts (or Milk Stouts/Sweet Stouts) are a version of stout which have had lactose sugar added to the beer to add sweetness and some body. The sweetness helps give a little balance to any roasted character the stout may have, and with many stouts made today, Red Roostarr also has coffee added to it for an overall greater complexity. Coffee Stouts are one of the most popular types of stouts being turned out by craft breweries today, with the richness of a strong flavored coffee and the roasted character of stouts being delicious compliments to each other. Visit the Starr Hill website HERE and the Red Rooster Coffee Roasters site HERE. ~ by thebeerroad on March 4, 2013. Listen, It’s Not Me, It’s…Completely, Absolutely You. Hey, Stay Off Of My Lawn, You Damn (Muted, Mundane) Beers! Draft Beer At A Coffee Shop? Of Course. Microfestivus 2016: Location, Location, Location…and beer. Brewpubs, Breweries & Craft Beer Stores. Events. Random Thoughts. The (Beer) Road Less Traveled - Getting Into Better Beer. The Road Map - One Guide To Better Beer, Style by Style. Any chance to try good beer is worthy of note. Don't forget, there is a weekly beer tasting of usually 2 to 3 beers at Roanoke's Wine Gourmet, Friday's, 5 to 8pm.